If you're a gamer who doesn't know who Nolan North is, we can guarantee you've heard him. The ubiquitous voice actor has appeared in dozens of games over the years, adopting countless accents and tones. But perhaps he's best known for doing his own voice as Nathan Drake, the hero of Naughty Dog's Uncharted series. In just under six months' time, we'll finally get our hands on the eagerly anticipated Uncharted 4: A Thief's End, but before then we've a chance to refresh ourselves of the story so far. Uncharted: The Nathan Drake Collection, which includes the PS3 Uncharted trilogy, will launch on the PlayStation 4 on October 7. Not only does Nolan do some amazing voices, he's also witnessed the videogame industry rise to bigger-than-Hollywood status. So we chatted to him about how capturing Uncharted has changed over the years, why people are wrong about Batman's Penguin, and how he approached overwriting Peter Dinklage in Destiny. You've done a bit of TV work over the years. How much does the experience differ with performance capture? For most games you don't have to learn your lines. It's nice to be familiar with them, but for a lot of games you're in a booth alone and you're reading your script. With Uncharted it's a lot different. Uncharted is more like doing live action than it is doing any of the other games. This was one of the first and the biggest to employ motion capture - or performance capture as they call it now - which is like saying 'I don't live in the nice neighbourhood, I live adjacent to it' [laughs]. So performance capture, motion capture, whatever you want to call it, is very much like theatre, where I started. It's minimum props, it's all imagination, working with your fellow actor to make that virtual world that no one can see at the time, to come to life. Because you're literally working in an open empty space, and the animators and the geniuses at the developing office, they make that world around you come alive. So you just have to employ your imagination. I've said before, it's a lot like when you see little kids playing. They never stop to go 'Ok, where was the boat again?' And when you get into that spirit, good things happen. 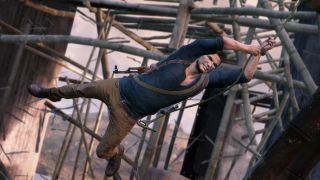 How has the performance capture process changed over the course of the Uncharted series? In Drake's Fortune, the first game on the PS3, the developers, the programmers, the artists, they were all working on how much of that processing unit that they could tap out of it. And by the third game, same machine, the effects and everything were so much better. To be perfectly honest, it's way above my pay grade. These people are smarter than I'll ever live to be. So when we look at what Uncharted 4 is going to do on the PS4, I've seen some pretty amazing tests with the reality in the eyes and the face, and the way they've mapped my face for Drake. These little wrinkles in my cheek are in his face now. In the first Uncharted there's a scene were Elaine and Drake run and jump into a jeep and drive away and then it gets stuck and it's about to fall off the back of a cliff. For that scene they brought in a jeep that was the same colour as that, I think they'd rented it for $800 for the day. And it was full of mouse poop and it smelled and it was all metal, it was just an old metal jeep. And it was banged up and bruised, I remember Emily had a pretty good bruise on her leg somewhere. By Uncharted 2 they just took blocks. They realised we don't need an actual jeep, just blocks. But it looked kind of like a jeep.